So a man wants to commission a portrait. One of himself all dressed up like a tiny King Edward V, right down to his little red tights. 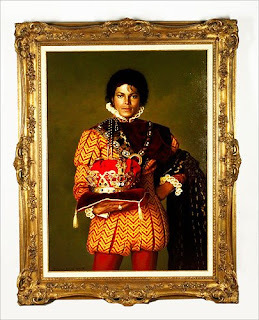 And he will hang said portrait in his home to gaze at himself because he is, after all, crowned the King of Pop. While it may strike the average person as being a bit odd, who is to say? And then same said man, wants to have a statue of a tiny girl in a blue onesie jumper, licking an ice cream cone, and holding balloons. Well, you hope he is only having it commissioned in order to donate it to a city park and not actually going to keep it in his home. Or in the alternative, he would have such a statue as a tribute to some nice family member for her birthday perhaps. Or by some stretch, he would have it only as a testament to good will and welcoming gestures. No need to even remark on the reputation of said man, right? 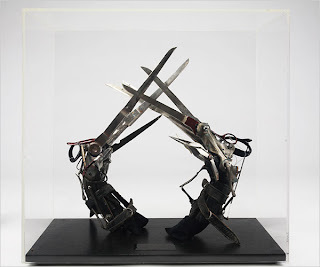 But then, same man, decides what would be even more welcoming and indicative of good will but to have the prop hands from the movie Edward Scissorhands on display as well. Because nothing extends a warm invitation to family and friends then gloves made of metal casing adorned with razor sharp talons. 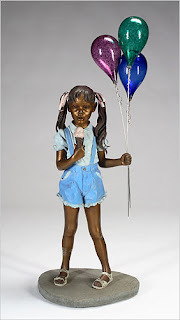 And just adjacent to the statute of the girl eating ice cream, well, you have your own year round House of Horrors. Welcome kids! I bet you just can't wait to come over. Do you like an uncomfortable scene of distate? A rolling sea of weirdness? There is plenty of room for everyone! These photos are from the actual catalogue of auction items from Neverland Ranch. What a treat. Because now even the most mortal of men, who may have been curious how I too can adorn my home with creepy things will have their chance.